Armchair fiction presents extra large paperback editions of the best in classic science fiction novels. 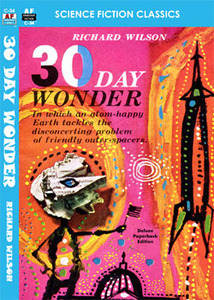 “30 Day Wonder” is a great tale in which Aliens comically invade Earth, written by science fiction specialist, Richard Wilson The story revolves around a reporter—a good one—who’s an average guy with a sense of humor and reasonable views about the rights of his fellow man. Maybe that’s why the Monolithians picked him to head up their public-relations program. After all, they had to reach a lot of average people and even though they were invulnerable, they couldn’t afford to take chances. Because they had a message, and EVERYBODY had to be convinced. So he didn’t have any choice in the matter…That’s where the system went wrong…no choice. Act peaceful. Love thy neighbor. Obey the law. Why, people could go mad living that way. And many would.